Florence isn’t just the birthplace of the Italian Renaissance: this UNESCO-listed city is also the capital of Tuscany, surrounded by the region’s beautiful countryside. With three days to explore, here’s how to enjoy Florence’s artistic and architectural masterpieces and also take a day trip beyond the city limits to the Tuscan hills. One of Florence’s most iconic works of art is Michelangelo’s David, an image that graces everything from T-shirts to calendars at souvenir shops throughout the city. Savor this soaring statue with an early access tour first thing in the morning, taking in the beauty of the work before the crowds arrive. Afterward, continue on to discover Florence’s other famous marble masterpiece: the Duomo. 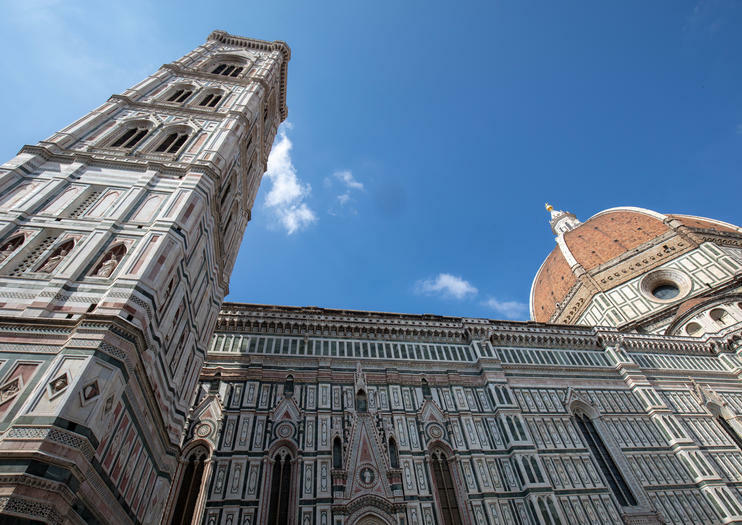 Opt for a tour with skip-the-line access to the complex, or you will spend precious hours waiting to enter the church, baptistery, bell tower, dome, and museum. Once you’ve explored two of the city’s most important cultural treasures, take the rest of the day to get to know its Renaissance center. Hop-on hop-off tours are a convenient way to get a feel for the city, or guided Florence walking, bike, or Vespa scooter tours generally include highlights like Ponte Vecchio and Piazza della Signoria. The Uffizi is one of the most popular museums in Italy and attracts millions of visitors each year. The best way to enjoy important works by Botticelli, Leonardo da Vinci, and Michelangelo—without being overwhelmed by the size of the collection and the crowds—is to opt for a guided tour that includes early entry before the galleries open to the general public. After you’ve had your fill of art, it’s time for gastronomic delights. Florence is known for its excellent cuisine, and you can sample some of its best food and wine on a gourmet tour of the city or by joining a cooking class. Food and wine tours often stop at the city’s outdoor markets, street food stands, restaurants, wine bars; during a cooking class, you can delve even deeper and discover the secret to preparing Florentine dishes before sitting down to enjoy them during an informal meal. For much of the year, Florence is packed with tourists drawn by the importance of its art and beauty of its center. For a respite from the crowds, take a day to explore the quiet countryside or smaller towns in the surrounding region of Tuscany. Popular Tuscan towns include elegant Pisa, medieval Siena, and charming San Gimignano; if you’d like to relax on the coast, opt for a day trip to the five fishing villages of the Cinque Terre in the neighboring region of Liguria. Another popular option is to explore the rolling hills of Chianti: Tuscan wine and food tours are perfect for foodies, or the more adventurous can choose to explore the countryside on a horseback ride, by vintage Fiat 500, or by joining a bike tour. For a truly unforgettable view of Tuscany, take a hot air balloon ride over its postcard-perfect landscape. Get a bird’s-eye view of the Tuscan countryside on this 1-hour hot air balloon flight. Departing from San Casciano in Val di Pesa, an expert captain will lift you 2,000 feet (609 meters) into the air. Soak up unparalleled views of Tuscany’s olive groves and vineyards spread out below, as well as quaint villages and stunning castles. Then toast your adventure with a complimentary glass of Champagne after descending back down into the countryside. See Italy from behind the wheel of a retro Fiat 500 on this 4-hour tour through Tuscany. Take a spin around the countryside, enjoying panoramic views of Florence and a stop at the Church of San Miniato al Monte. Your guide will lead the way to a private terrace, where you’ll enjoy a delicious Tuscan lunch before cruising back to your original departure point in Florence. Indulge in a true taste of Florence on this food and walking tour. Led by a foodie guide, travel through the streets of the Renaissance city and stop at the top local haunts. Check out the fresh produce at the San Lorenzo Market, try the bold flavors of an Italian coffee, and peruse a Florentine delicatessen. You’ll sample plenty of specialties along the way, including cheeses, breads, olive oils, gelato, and Italian wine. Numbers are limited to 12 people to ensure an intimate experience. Be one of the first of the day to tour Florence’s Accademia Gallery, and finish with an Italian breakfast in a local cafe. It’s a Viator Exclusive tour that can’t be booked anywhere else! In a small group, limited to just 15, you’ll explore the famous gallery without the crowds, and learn about Michelangelo’s works from an art-historian guide. Swoon at the sculpture of ‘David,’ hear the history of ‘San Matteo’ and gain insight into the influential art of the Renaissance. Learn to prepare authentic Italian dishes during a private cooking class in Florence. Get hands-on culinary instruction from a professional chef inside a well-equipped home kitchen, where you’ll learn time-tested tips and tricks you can use to impress family and friends. Customize the experience with your choice of three different menus, and enjoy your homemade creations along with wine pairings at the end of the lesson. Zip through Florence in true Italian fashion on a 3-hour Vespa tour. Ride on your own scooter while a guide leads you to some of the best panoramic views in and around the city, including Piazzale Michelangelo, the convent of San Miniato, and the ancient Roman hill town of Fiesole. Stop often to take photos and enjoy the thrill of riding through the city streets.